"I have always sought perfection, and believe it or not, perfection of form. In any work of mine you will find a plastic form, viewed objectively and purely for itself, subject to the laws of light and shade, displayed with the limited resources of the 'modelé'... my art is limited to the capabilities of chiaroscuro." - Leon Spiiliaert, translation by J.L. The beach at Ostende, Belgium is known for a phenomenon called 'blue apple, green sea" , a trick of the light that makes the sky seems to fall on the water, changing the colors of sea and sand before the eyes. 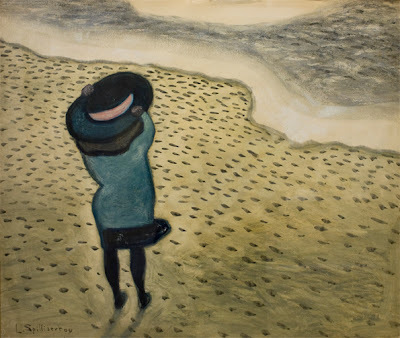 An artist of wit and strange magic, Leon Spilliaert (1881-1946) has often been regarded as a creator of worrisome and even disturbing imagery. 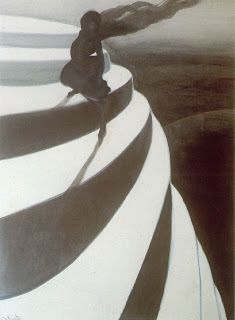 Acknowledged for his masterly use of gouache, pencil, India ink, and charcoal, Spilliaert the man suffered from ulcers, hence the insomnia that made him a night walks on the shore. On the evidence of the images, you have to put on blinders to miss his acute interest in the others who inhabit them. Spilliaert's Fillette au grand chapeau (1909, Offa Gallery, Knokke-le-Zoute - above) dates from seven years before his marriage to Rachel Vergison and nine years before the birth of his daughter Madeleine, but the humor and even joy of the wind and the other elements is there already and in full. I like to think of the night as the artist's companion as he walked along the shore. Spilliaert's friend, the symbolist poet Emile Verhaeren, wrote that the silence of the night was so large that even the ocean listened. 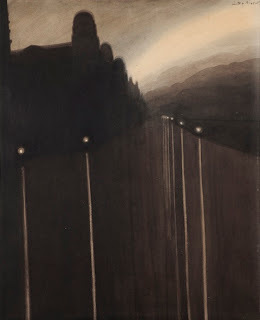 In Digue la nuit (Dike at Night) the verticals beams cast by the streetlights cut through the moist air hanging over the embankment something like what daylight does to the water, or so Spilliaert makes us see it. 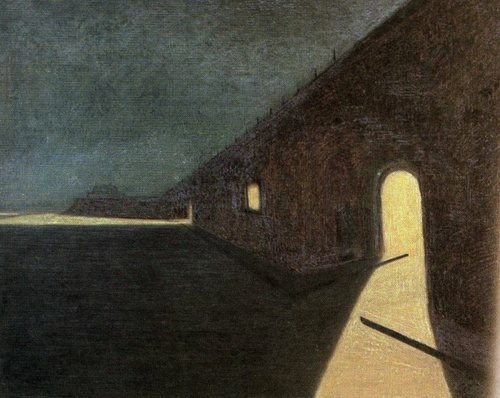 The Kursaal at Night, from the same year, 1908, can be viewed as either remarkably abstract ( in retrospect) or as a surreal precursor to Giorgio de Chirico's deserted plazas. His figures are enigmatic but more varied in their particulars than received opinion allows. Some do appear as emblems of waiting, anxiety or loneliness (The Gust, Vertigo) while others like Les Postes and L'elevation are fanciful without being in any way sinister. 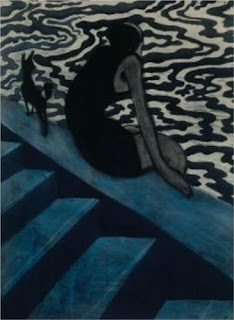 Balance La Baigneuese, a woman relaxing on the seawall with her little dog after a swim, with the the nightmare vision of a woman perched high over an undefined abyss, clinging to the stairs in fear of Vertigo. 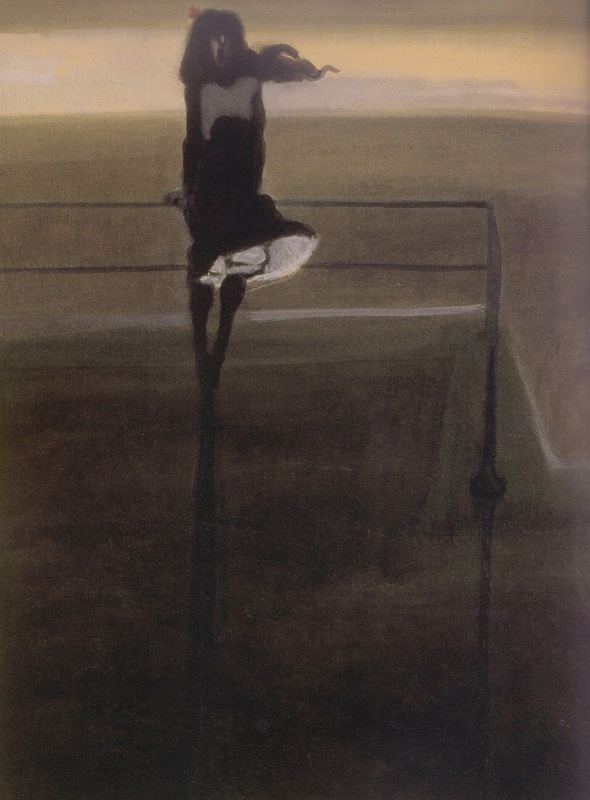 In 1904, the year of The Gust', Spilliaert's work was exhibited alongside that of Pablo Picasso at Galerie Clovis Sagot in Paris. Yes, there are noticeable affinities with Fernand Khnopff, Edvard Munch, and Odilon Redon but Spilliaert's work could stand all comparisons. His nocturnal scenes are highlighted by splinters of light, delicately gilded in pinks and blues; his pastels of fishermen, women walking dogs, or peasants camped on the piers, are expertly modulated in color chalks. Leon Spilliaert was a real Oostendenaar, as a native of Ducth-speaking West Flanders. He grew up in the coastal beach resort of Ostend where his family ran a perfume shop that catered to the tourists. Yes, he read books by Edgar Allan Poe and Nietzsche, as did legions of his contemporaries. 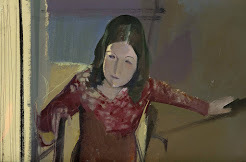 It provokes a smile to think of the diffident young Spilliaert followed James Ensor around Ostende, too shy to introduced himself to the older, established artist, even though Leon's uncle Emile was a member along with Ensor of the Cercle des Beaux Arts d'Ostende. Ensor, now there was a man of seriously perturbing sensibilities. Leon Spilliaert - The Gust of Wind, 1904, Musee d'Ixelles. Leon Spilliaert - Digue la nuit (Dike at Night)), 1908, Musee d'Orsay, Paris. Leon Spilliaert - The Kursaal at Night, 1908. Leon Spilliaert - Vertigo, 1909, Musee des Beaux-Arts, Ostend. 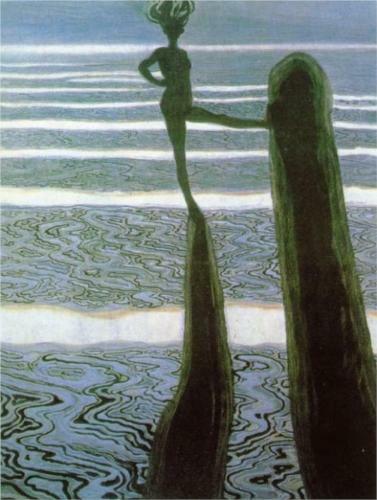 Leon Spilliaert - Les Postes) The Posts, 1910, private collection, Belgium. Leon Spilliaert - L'Elevation, 1910, private collection ? 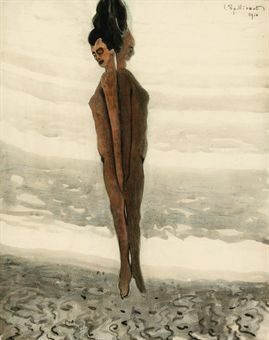 Leon Spillliaert - La Baigneuse (The Swimmer) , 1910, Belgian Royal Museum of Fine Arts, Brussles. Just as compositions, these are so strong, before you get to all the subtleties of color and other elements you point out. He's particularly good at a figure in a landscape, seen from behind. Neil, by all accounts Spilliaert did a lot of solitary walking. It's maddening to think of him following Ensor around the streets of Ostend and never having the nerve to introduce himself. Unlike Ensor, though, he viewed people not just with foreboding. There's a lot of wit in his images - or at least smiling - in his work, especially of children and dogs. No wonder there's a life-sized monument of Vertigo on the beach at Ostend. Why The Blue Lantern ? A blue-shaded lamp served as the starboard light for writer Sidonie-Gabrielle Colette's imaginary journeys after she became too frail to leave her bedroom at the Palais Royale. Her invitation, extended to all, was "Regarde!" Look, see, wonder. Broadcasting: Jazz, classical, and spoken word on NPR affiliates. Studied classical piano. Education: Syracuse University & State University of New York. Internship at American Demographics Magazine (Cornell University). Internship at Syracuse University Press. Freelance arts journalism for alternative publications and art galleries. NOTE:Audio clip posted 03/17/14. "I am out with lanterns"
The Pyramid Of Capital ! Angelo Morbelli: For Eighty Cents! And while you're there...read something!